Back in World War 2, propaganda posters were huge. They attempted to compel the public to help out in the war effort no matter what their status was. One such British propaganda poster referred to not speaking in public about details that may be useful to the Germans. “Furtive Fritz” may be lurking around and pass along that information back to the Nazis. 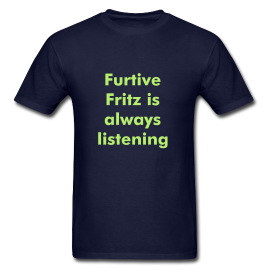 Thus, “Furtive Fritz is always listening – Be careful what you say” was used. 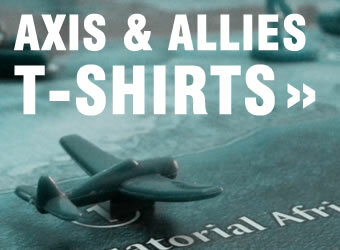 We’ve taken that ‘slogan’ and put it on a t-shirt, which is available in our online Axis & Allies store (all colours are customizable). « Research Rolls: Do They Make Sense?